Seller: Silver Arrow Cars Ltd.
We Ship Worldwide and can assist with export/import and shipping arrangements on your behalf. Please contact us for details and quotes. The BMW New Six CS (internal name BMW E9) was a two-door coupé built for BMW by Karmann from 1968 to 1975. It was developed from the New Class-based BMW 2000 CS coupé, which was enlarged to hold the BMW M30 straight-6 engine used in the E3 sedan. The E9 platform, especially the 3.0 CSL homologation special, was very successful in racing, especially in European Touring Car Championship and the Deutsche Rennsport Meisterschaft. This helped to establish BMW's status as a sporty driver's car. The 2800CS was replaced by the 3.0 CS and 3.0 CSi in 1971. The engine had been bored out to give a displacement of 2,986 cc (182.2 cu in), and was offered with a 9.0:1 compression ratio, twin carburettors, and 180 horsepower (130 kW) at 6000 revolutions per minute in the 3.0 CS or a 9.5:1 compression ratio, Bosch D-Jetronic fuel injection, and 200 horsepower (150 kW) at 5500 revolutions per minute in the 3.0 CSi. There was a 4 speed manual and an automatic transmission variant. Performance was very competitive with contemporaries. In 1972 just 2,999 CSi manual transmission coupes left the factory. A total production run from start to finish was less than 8,000 cars. 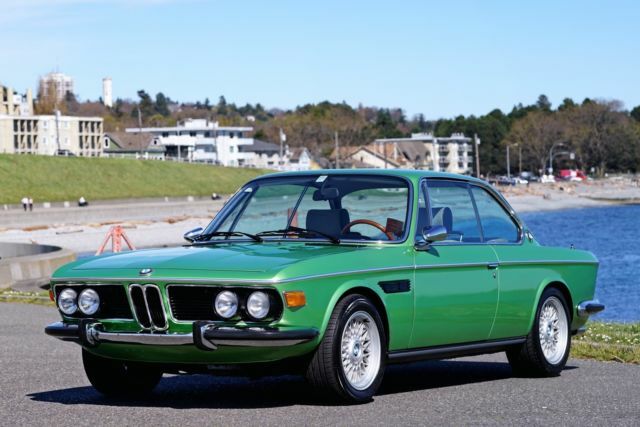 The 3.0 CSi on offer here an original Euro-spec car from Switzerland finished in its original Taiga green livery. This CSi was imported to Canada over twenty years ago by the original owner. It’s all original, save for a Getrag 5-speed transmission upgrade. We still have the original 4-speed transmission with the car. It had one re-spray in the original Taiga green prior to transport to Canada, and presents beautifully. It's on 16" BMW mesh rims/tires at present, but we also have the mint original 14” Alpina rims with good rubber. A paint meter report is availble via PDF. The meter results show the car is not full of filler. The door sills and engine bay are still showing original paint. The panel fit is very good, but not like a restoration would be today. The paint shows very well for being over 20 years old. There are a few blisters showing and a couple of little chips, but overall is very presentable. The engine bay looks pretty original with some evidence of clean-up and servicing. I know the car has just gone through a local shop and has been serviced. The car fires up easily, does not smoke, and idles well. It runs and drives very well. The upgraded suspension is firm, but not too stiff. Clutch and transmission work extremely well. It has a very long first gear, but is an excellent cruiser. Acceleration is pretty good for a car of this age. Steering and alignment is good. The interior presents very well. The cloth seats are a very “Euro” option and could be easily convertedt to vinyl or even leather to match the door panels. A period correct Nardi wheel installed in the car, but we also have the original BMW steering wheel. The gearshift knob is a later M-Series one, we do not have the original shift knob. The stamps in the service book show the last “official” service in Switzerland to be at 127,420 km on 18/4/1985. It now shows 36,562 km. The odometer is not functioning properly so the actual mileage is not known. The actual mileage is likely very close to what is shown, but I cannot confirm when it stopped working correctly. While it isn’t perfect, it is an excellent driver. The car comes with all of the original parts I mentioned above and it’s documentation. Oil was changed recently and the car was generally inspected for safety and for mechanical fitness. It is ready to drive away! The E9 model BMW is highly collectable in any form, but the CSi and CSL are the most desirable and are highly sought after by enthusiasts and collectors alike. This is a very well kept example with good history and two previous caretakers who obviously put a lot of effort into keeping the car roadworthy and in very good condition all around. There aren’t many 1970s European sports cars that you can buy these days for under 100k… This is definitely one worth hanging on to. Please call Robert at +1 (250) 532-6547 to have any additional questions answered or to see the car in person. Used vehicles are sold "as is", "where is" with no warranties either expressed or implied. We do not accept refunds. Winning bidder must contact us within 24 hours of the auction end, and make arrangements for payment at that time. A $2,000.00 deposit is due within 48 hours of end of auction. The remainder is due within 7 days of auction end. If no contact is made within 24 hours, we reserve the right to re-list the vehicle, sell it to the next high bidder, or sell it otherwise. The car is advertized locally. We reserve the right to end the listing if the vehicle is no longer available for sale. Seller accepts Paypal for deposit only. Make sure if financing that your financial institution accepts the year and miles of this vehicle before bidding. Please arrange financing prior to bidding. We can assist buyer with export/import and titling in Blaine, Washington at the buyers expense. The process is very simple. Please inquire about costs (shipping from Victoria to Blaine, brokerage fees, duty).